Built 1905-1912 by Antonín Balsanek and Osvald Polívka, replacing an academy building and Saint Vojtech's church. 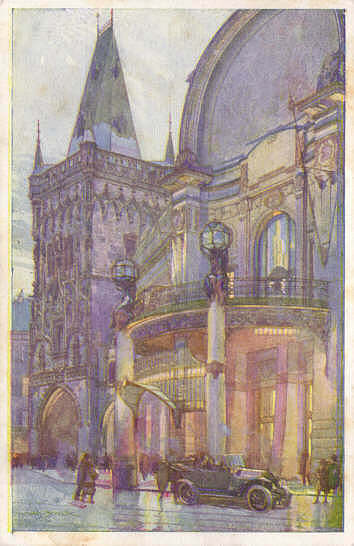 Paintings by Mikolas Ales, Vaclav Jansa, Alfons Mucha, Jakub Obrovský, Jan Preisler, Josef Wenig, Karel Spillar, Max Svabinský, Josef Ullman, Frantisek Zenísek. Sculptures by Josef Maratka, Josef Vaclav Myslbek, Karel Novak, Ladislav Saloun, Frantisek Uprka, Bohumil Kafka and Cenek Vosmík. The complex contains a café, a restaurant, shops, several function rooms, and a concert hall. Officially opened 22 Nov 1912. 1994-1997 major renovation. 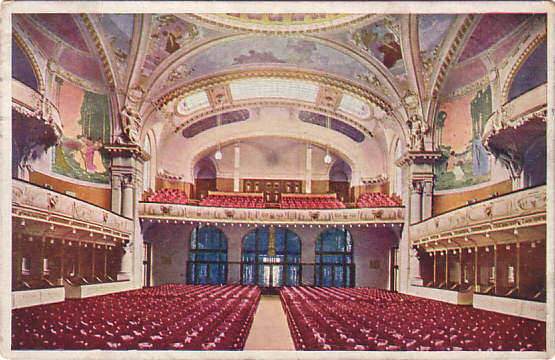 Concert Hall "Smetanova Sín" (also known as "Smetanuv Sál"), named in honour of the Czech composer, Bedrich Smetana (1824-1884). Home to the "Symfonický orchestr hl. M. Prahy FOK" (Prague Symphony Orchestra). 1140 seats. 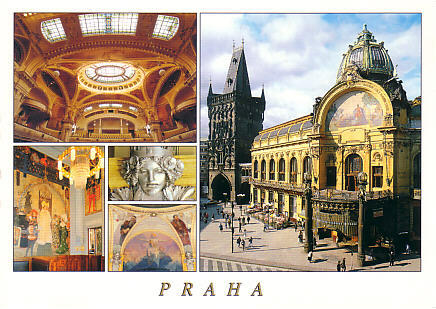 Reverse Text: "Praha, Prasná brána - Praga, Gorochovaya dashnya - Prague Powder Tower"
Reverse Text: "Praha, Obecní dum u Prashe Veze - Sál Smetanuv"
Reverse Text: "Praha, Obecní dum hl. m. Prahy a Prasná brana - Prag, Das Gemeindehaus der Hauptstadt Prag und der Puverturm - Prague, The Municipal House of the capital city of Prague and the Powder Tower - Prague Le Palais municipal de la capitale Prague et la Tour Poudrière - Praga, Il Palazzo municipale della capitale Praga e la Torre delle polveri"
Reverse Text: "Praha, Obecní dum - Prague, Municipal House"